Can it be that another month is finished? It's blown by so fast that I think I was productive....but it's all rather hazy. I can blame this on the last two busy weekends :-) I don't usually have a social life, and all of a sudden, two major events, two weekends in a row! It was a lot of fun, but the quilting was mostly put aside. Except for this first project what was done this weekend, most were done a long time ago - at the beginning of the month. I brought the block with me this weekend to Toronto and had a little time to work on it. I finished it on the drive back to Ottawa earlier today. I'm sorry I didn't iron it but since it was on light gray fabric, I ended up using both a Frixion pen and a fabric pen. I'll have to wash the block first before ironing it, otherwise I risk setting in the fabric pen. The deadline for linking up is today, so this is what I'm posting! I found a little bit of time to work on this project. 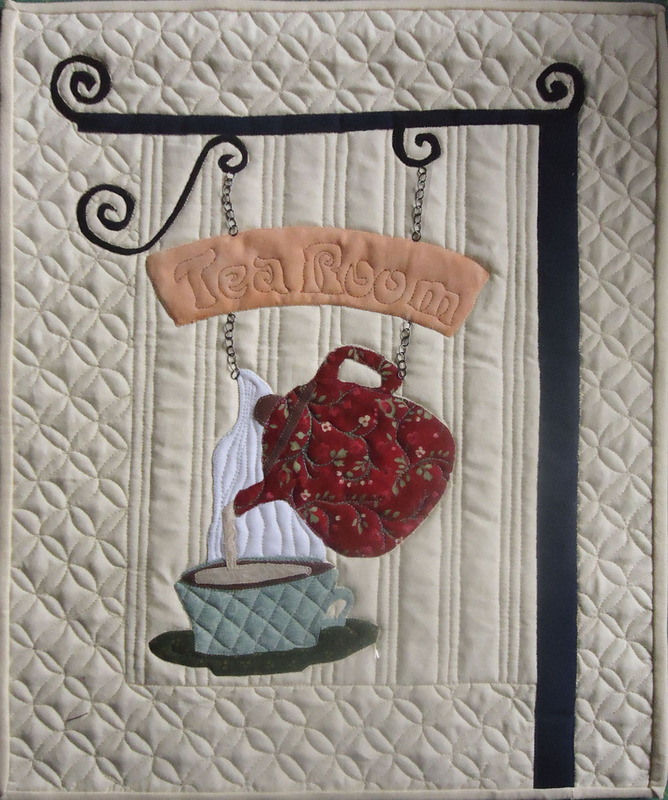 I'm glad that Myra of Busy Hands Quilts is hosting this quilt along. It's encouraging me to keep working on this project. I just took the pictures this evening and it's very gray outside - the colours are much more vibrant in person. 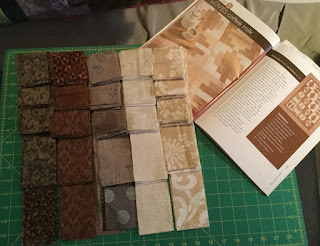 This month I trimmed all of the finished blocks. This went much better than the neutral quilt below (see the "What I learned" section below). I already had a few rows sewn together and added a couple more this month. You may have noticed that the fabrics are not the correct colours, nor are they solids. As much as I love the original pattern, there was no way that I was going to manage putting all of those colours in the right place. That's just too much fussiness for me. 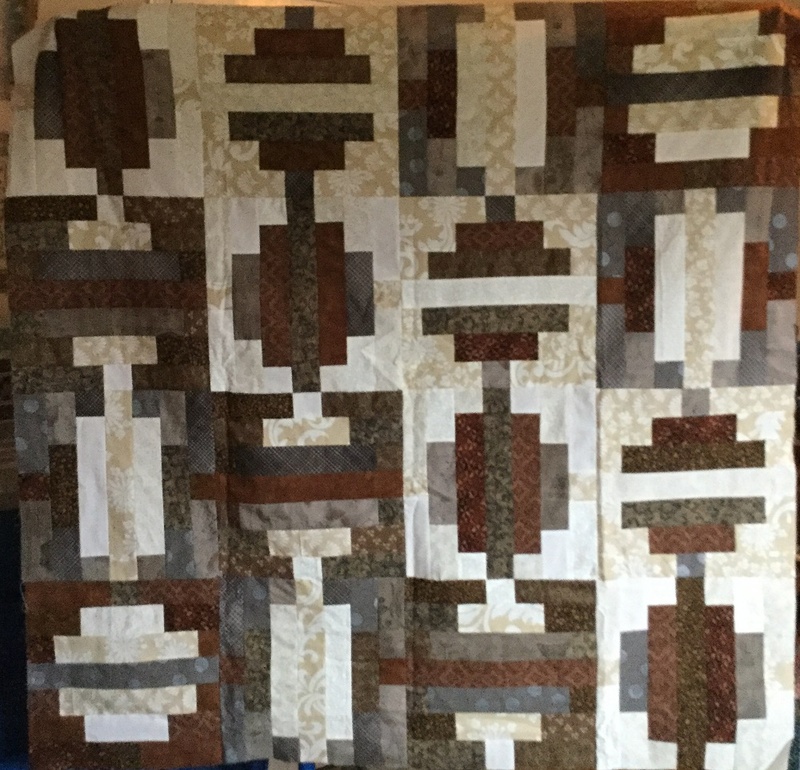 Instead, I printed the image of the quilt in black and white, and have tried to keep to similar values. We'll see how well I did when it's done. 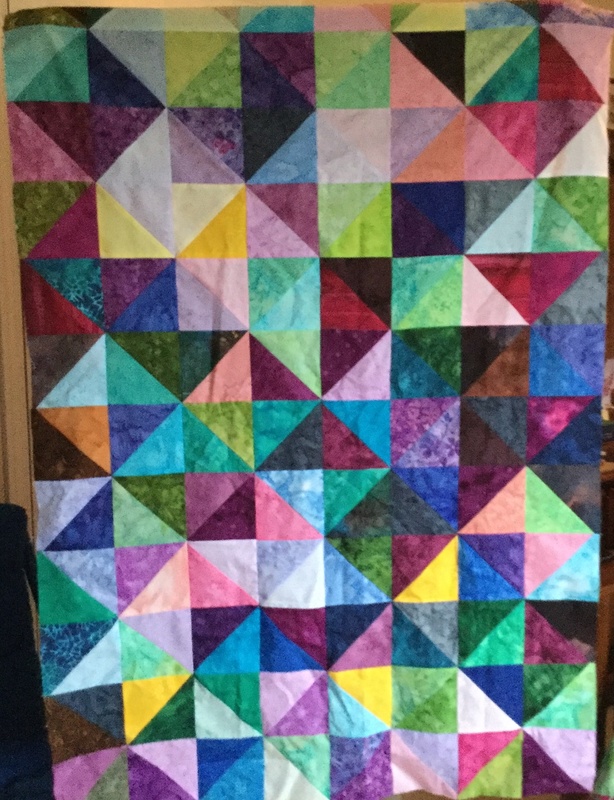 I was able to complete the quilt top since I spent the beginning of April working on it. I had hoped to finish the quilt this month for my sister-in-law's 60 birthday but we went partying with her and her family in Toronto instead. I'm sure that the quilt will be finished before her 61st! If my pictures are not very good, it's a symptom of a good social life. They will be better soon! 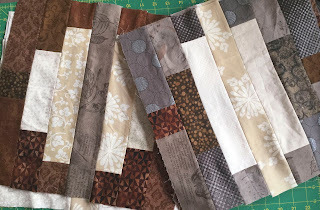 I trimmed all of the blocks for the neutral lap quilt, but the length of the strips were far from even. I wasn't always able to trim the blocks as I should - so some of them were not even from the centre. It's not a huge problem and mostly doesn't show, but it makes me rethink the wisdom of cutting fabric when I have a sinus cold! This was the fourth stop on our world adventure. I 💚 England and am happy that we stopped there for tea! This project has been around for a while and was my April OMG (One Monthly Goal). My next World Quilting Travel Adventure project will be the Hoopoe bird from Israel. I hope to start it in May. I've included the details of this project in the "What I Learned" section below. Here is an image of some of the details. This is the foundation paper pieced label I made for Tea Time. 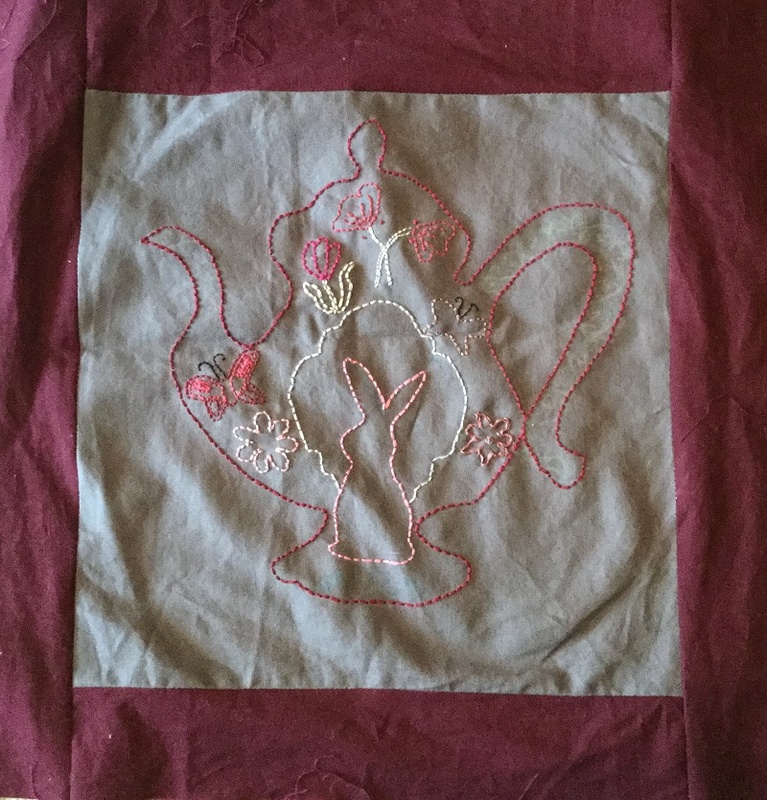 The Crafted Appliqué technique was perfect for this project. I loved the way that JoJo had quilted the piece, so I copied it. Before FMQ I marked all of the lines on point. Thank goodness my son looked at the project before I started quilting it since all of those lovely cathedral windows would have been very crooked. I didn't embellish the piece as much as I wanted - I think I may be tired! Oh well, I can always add beads later if I change my mind or am up to it. JoJo won ribbons for both her England and Oregon souvenir quilts. Check it out in the link below! Free Motion Mavericks! Thanks Muv! 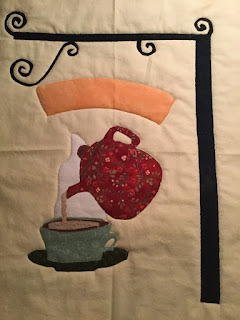 I was finally able to attend the Common Thread Quilt Guild meeting this month. 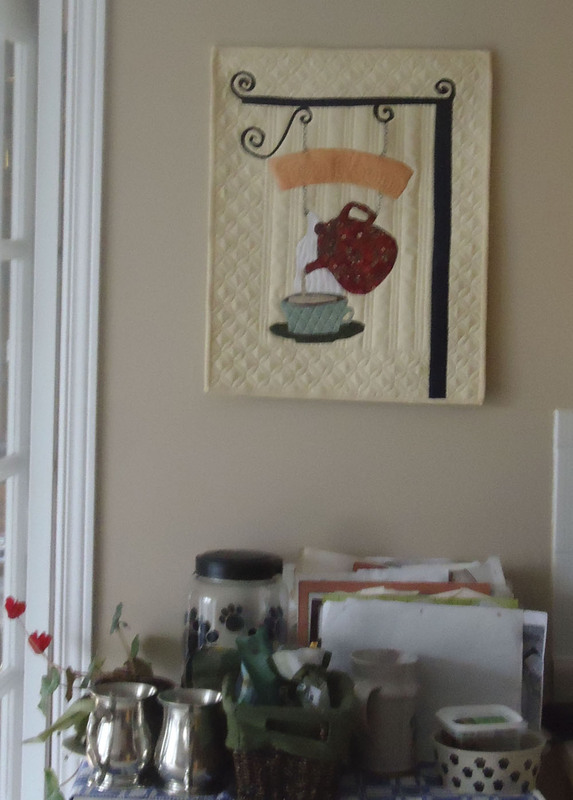 Our guest speaker was Michelle Gagné, an Ottawa professional long-arm quilter and prolific quilter. 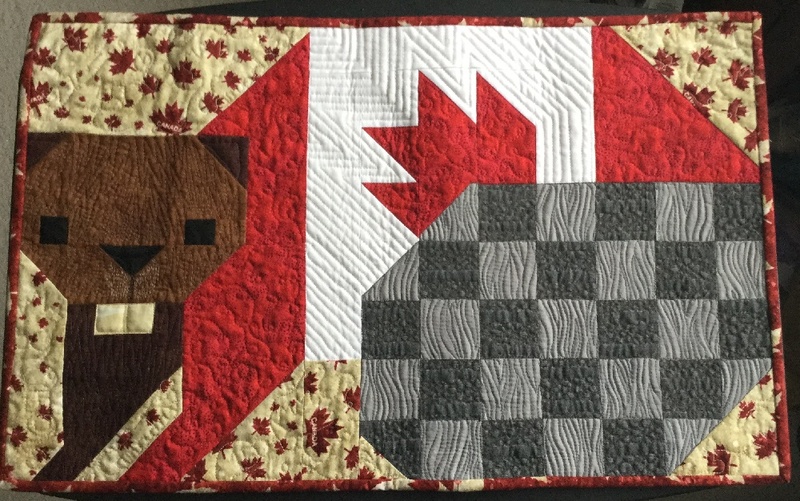 Here is her Canada quilt. I really like the way she made her centre red leaf. As for Canada`s Biggest Quilt Bee, our guild members have completed over 30 quilts and over a hundred blocks. 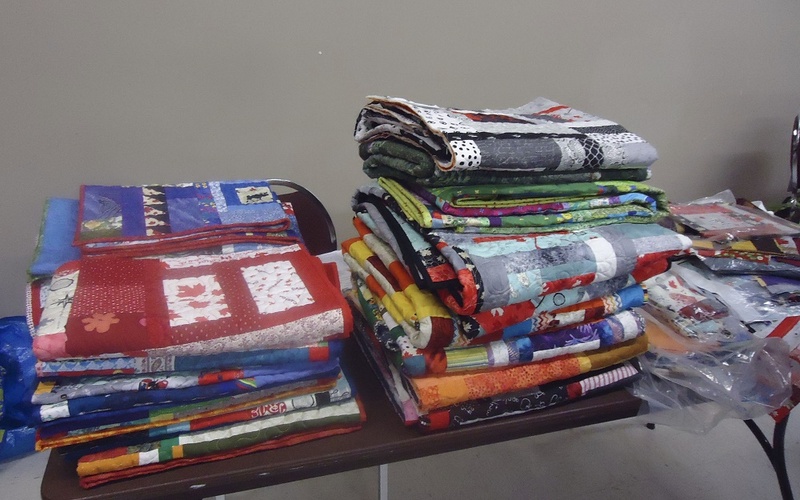 I handed in my 6 blocks at the meeting since I`m not likely to finish a quilt top before they send these to Toronto. The postcard quilt made last fall by guild members is part of the Eastern Ontario Inter-Guild Canada 150 Celebration Trunk Show. It will be travelling across eastern Ontario and can be seen at local quilt shows. If you live in the area, look out for it! 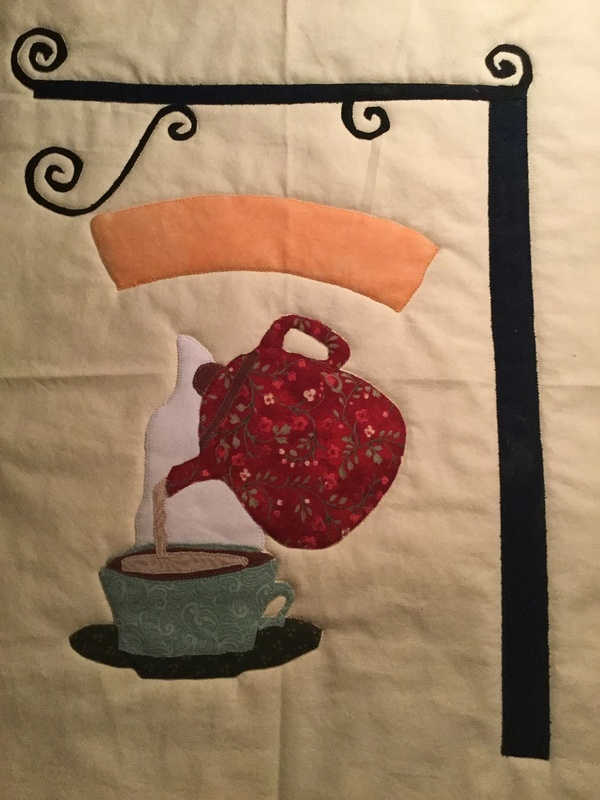 I'll be attending the Ottawa Valley Quilter's Guild Quilt Show - Festival of Quilts 2017. There will have a special 150 exhibit, which will include our Guild's Postcard quilt. The event is on Mother's day weekend, May 12-14. I'm really happy that it's their turn to hold the quilt show this year. 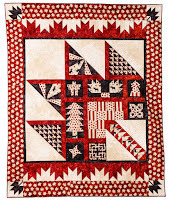 I'll get to see the quilts without having to do a lot of work, It will be a real treat! Since hosting these Celebrate - Fêtons 150 posts, I figured that I should be working on something for the celebrations. Do you remember this free pattern of the Canada 150 logo? Well, it's coming along. The paper piecing went well, although I learned a lot (from my many mistakes). Not the pattern's fault. I also want to make it longer to include the words "Canada 150, 1867 - 2017". This picture has 2 obvious mistakes.. This first image is both pre-ironed and pre-fixed - if you enlarge it, you may see that there is a piece of white missing between the top blue and yellow pieces. That was the easy mistake to fix. I used the Crafted Appliqué method to add a small piece of white fabric. It will be fine once it's quilted. The other obvious mistake is not easily fixed. I would have had to start that section over and undo a lot more since I didn't realize my mistake until I started putting the sections together. We all make mistakes and I can live with this one. It sure will make my logo easy to spot compared to anyone else's! If all goes well, I will add the "Canada 150 1867 - 2017" below the logo and quilt it by the first of the month for Celebrate - Fêtons 150 in May. 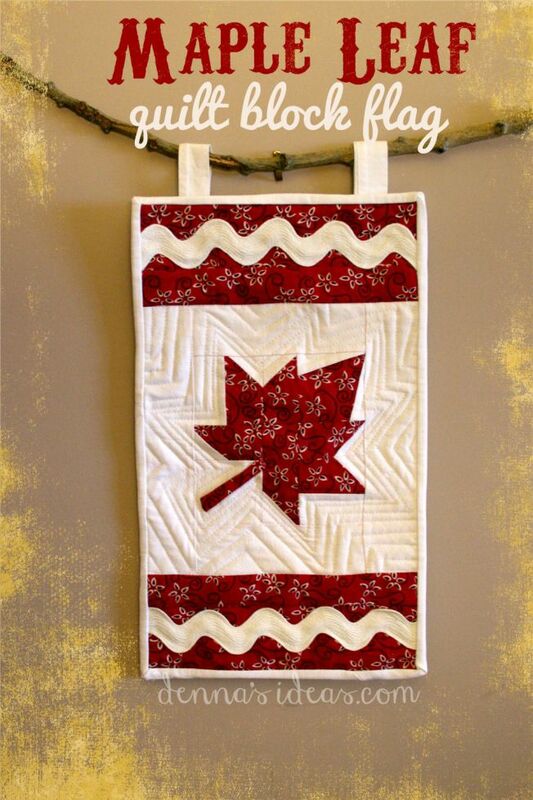 Here is another quilt pattern celebrating aspects of Canada. It always takes me a while to get into paper piecing. It's like I partially forget how to do it. The Canada 150 logo was relatively easy to follow, but I did find it tricky to put the finished pieces together. I don't think that it was the pattern, rather I need to stop when I'm tired before I make all of those mistakes! I'm happy to report that I've found space in my home for a couple of the art quilts I recently made. It's great to live with them! Common Thread Quilt Guild - more photos of the quilts made for Canada's Biggest Quilt Bee and the Postcard Quilt in our April newsletter. If you're making anything to celebrate Canada`s 150, please join the link-up on the first of every month this year. The linking party is open all month long. 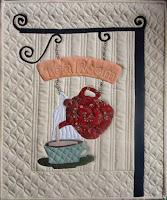 You can also win some very cool prizes - this month it's a pattern donated by Lorna of Sew Fresh Quilts. Fibre Fling 6 - A Success! I took most of last week off - to quilt, rest and then to volunteer at Fibre Fling 6. 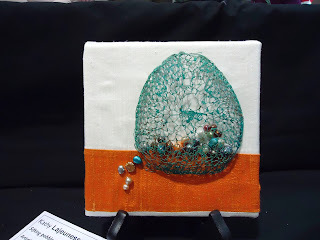 It was the ultimate holiday - taking time for myself, quilting, reading 2 books (that's how I rest), spending some quality time with my young adults and hanging out with fibre art and artists. As I was talking with visitors and fellow artists at the show, I was so excited - I swear I was high on life and art!!! I have been wanting to make a couple of neutral lap quilts for a while. For the last year or so I've been increasing my stash of neutral fabrics. The pattern I chose for the first quilt comes from More Take 5 Quilts by Kathy Brown. It's called Take 5 Loves Coffee Milk. 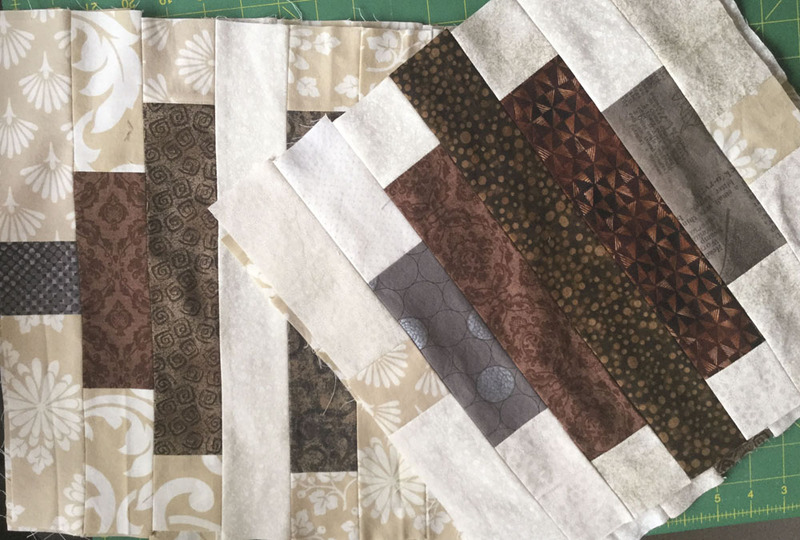 I don't usually cut all of my fabric before I start the quilt, but in this case I had no choice since each block requires pieces from all of the fabrics. It took me a while to get the hang of the pattern because I had substituted some of the colours and had to translate the pattern to my fabrics. Once I got the hang of it, it went really well. Just a lot of straight seams and no matching or points. My kind of piecing! Since the blocks are 14½ ", they sewed up quickly. It was also interesting to see the different colour combinations. I love the dark fabrics on the outside the best. I think that it's going to make a nice quilt. I've now completed 14 of the 20, 14½ " blocks required. The pattern is much larger than I need, but I'm going to make all of the blocks and then decide what to do with the extra ones. This might be my chance to make a partially pieced back. I've ordered and received the backing fabric - it's the wide backing and was on sale. Gotta love it! After participating in a Needle Felting Play Day last June, I had bought some supplies but didn't take any of them out until this week. I have to admit that I did so to justify buying a few more supplies - the shop is close to the Fibre Fling 6 venue! On Saturday, between errands, I took over the kitchen table and played! Turns out that mixing different coloured threads, wool roving and fibre is really good for my artist's soul. My first piece was made purely for fun. I wanted to use a merino wool and roving mixture that I purchased this week. It's so beautiful and soft that all I want to do is snuggle up to it! 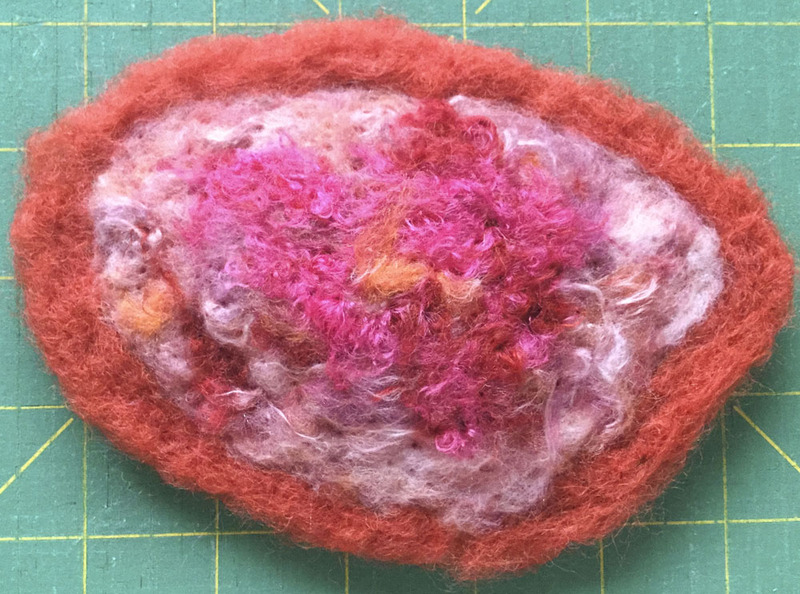 It reminds me of a scrumptious sherbet :-) I think that I've completed the needle felting part, but I would like to embellish it with beads. I have no idea how this piece will progress, but I'm sure that it'll come to me. 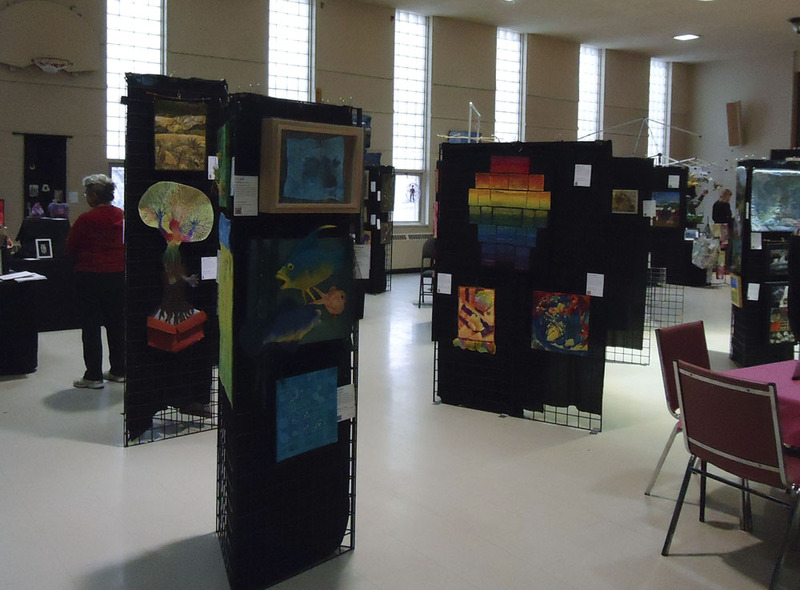 Here are a few pictures of Fibre Fling 6. Two of my pieces were in a great location - visible just as people walked into the room. Do you see them under the wonderful multi-coloured piece? Sifting Pebbles was made by my friend and ex-colleague Kathy. Isn't it lovely? Kathy created the copper wire knitted basket that is treated with patina in a workshop led by Sayward Johnson. The basket is displayed on a raw silk background to highlight its delicacy. The piece reminds Kathy of sifting sand and pebbles on the beach. I just have to share this last one - it was created in honour of the 20th anniversary of the Out of the Box artist group. 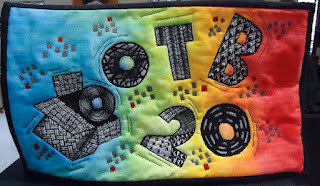 Véronique free motion quilted zentangle designs that she then shaded with water colours. I just love it! Out of the Box celebrates 20 years! 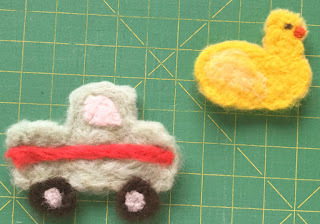 Cutting fabric is the perfect thing to do when I'm sick with a sinus cold and can't lie down. 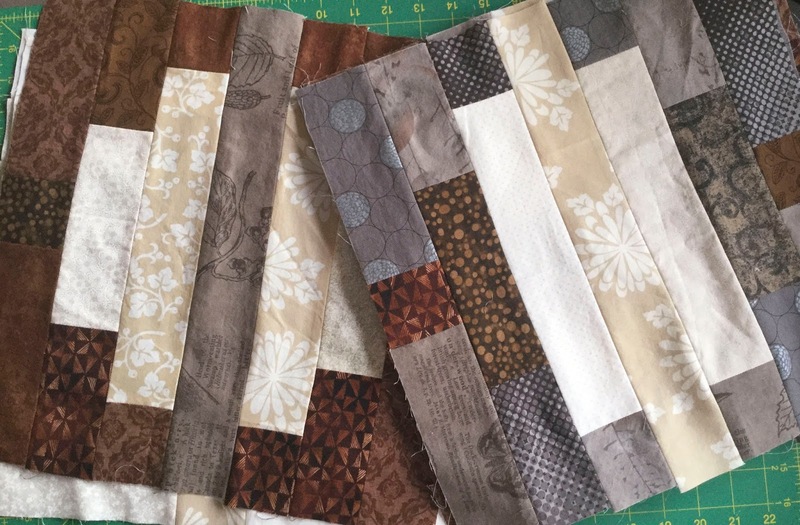 That's how I cut all of the fabric for my neutral quilt. I made sure that I was well organised and then cut the fabric while listening to the audio version of Inheritance, the 4th book of the Eragon Series by Christopher Paolini. I don't read, or listen to, a lot of fantasy, but this series rocks! There's nothing like guilt to motivate me. 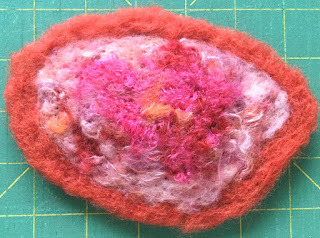 In this case I don't mind since I did end up felting. Welcome to the third month of Celebrate - Fêtons 150! First thing - Celebrate - Fêtons 150 in March was a success with 11 link-ups. Including those from the More Celebrations the Quilty Way post (March 13, 2017), there was a total of 16 comments. The draw was based on 27, and number 7 was the winner - which is the link up from Kathy K. Wylie Quilts. 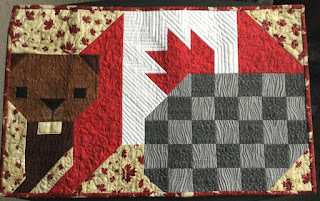 It's really great that we have quilting professionals linking their Canada 150 projects. 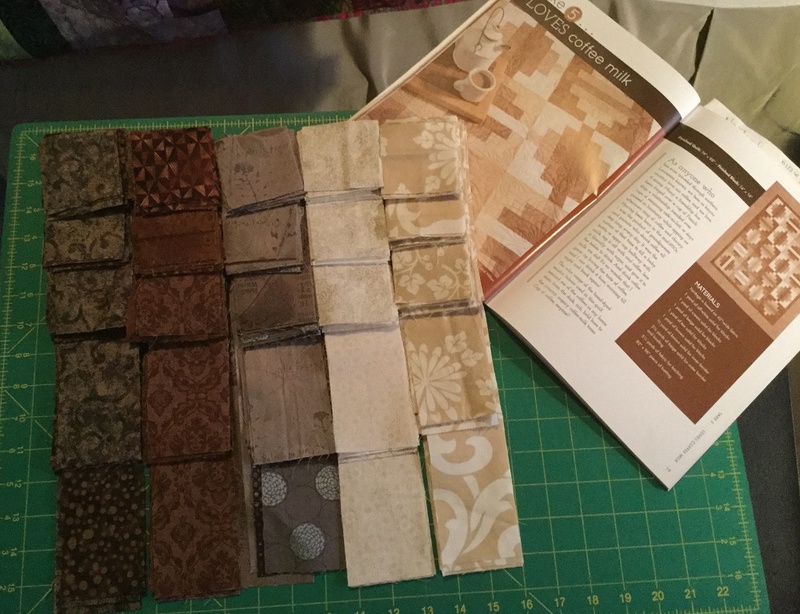 I'm looking forward to trying Kathy's technique and pattern this year. 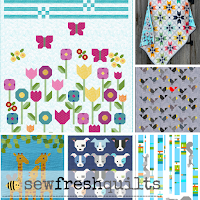 We are also in for a special treat as Lorna of Sew Fresh Quilts is donating one of her quilt patterns to the lucky winner of the April link-up. Thanks so more Lorna! 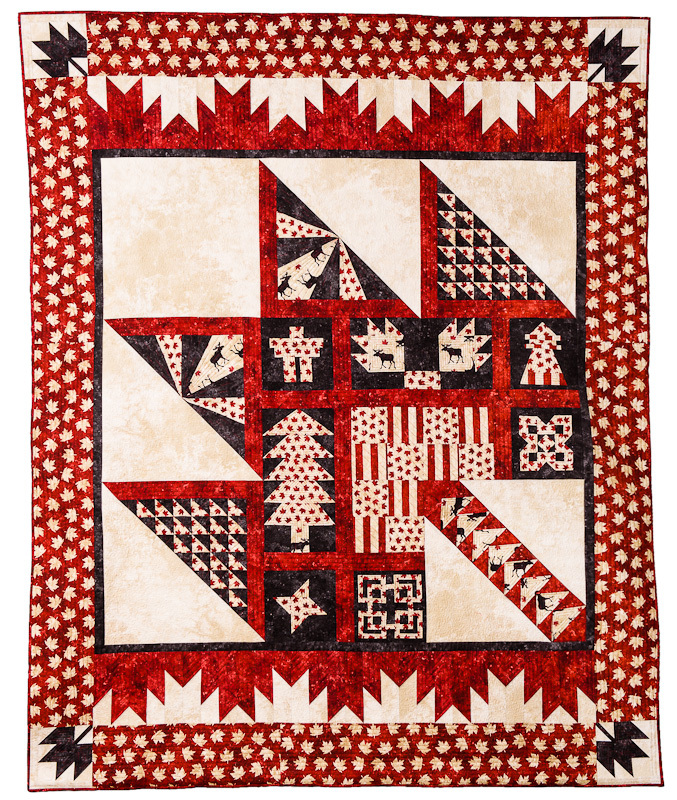 What else is happening in the quilting world to celebrate Canada's 150? Did anyone get to QuiltCon in Savannah this year? As I've been reading blogs and magazines about the event, I sure wish I had the chance to attend. It sounds wonderful! 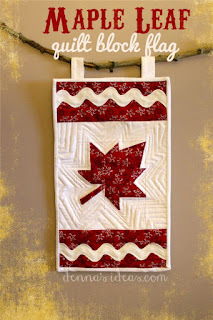 Lisa from Sunlight in Winter Quilts posted a few pictures of fellow Canadian quilters' work. Here is an original piece by Linda Hutchinson of the Toronto Modern Guild. 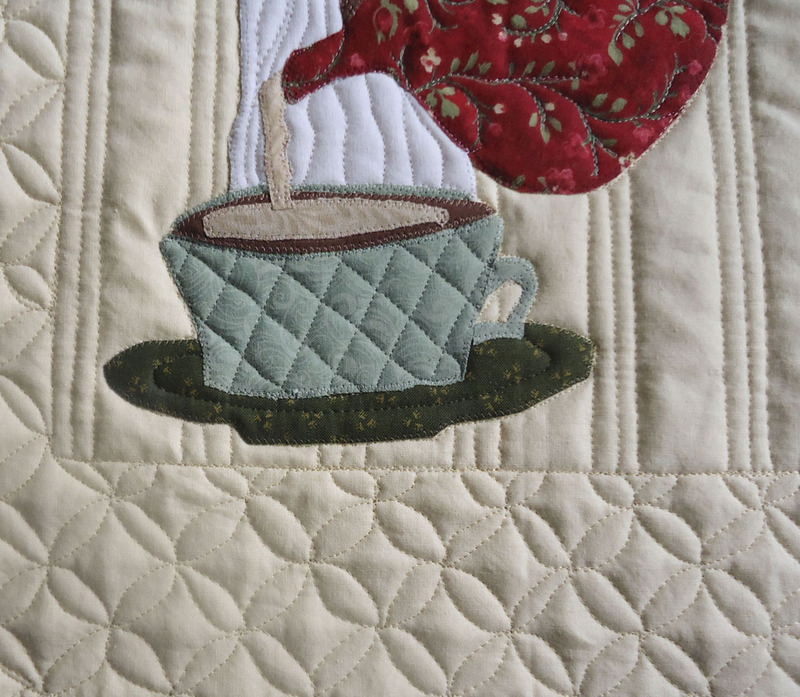 The quilt is hand quilted - and with luck we'll see it at Quilt Canada in Toronto this June. I haven't seen this design anywhere yet. The quilt is made up of 12 panels which can be bought in packages of 3. 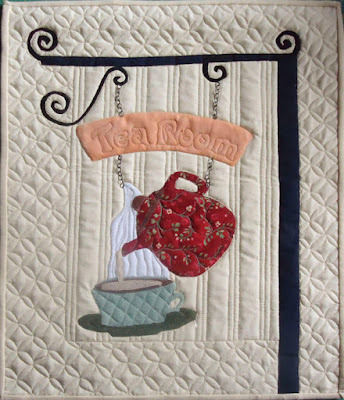 They can make a lovely quilt or wall hangings. See the link to Wonda's Desings in Related Links at the bottom of the post. This lovely 18" quilt block is the store's block pattern for the Northcott Trans-Canada Block Party. If you're in Calgary this summer, you can pick up the pattern or kit at the store. Otherwise, you'll be able to order it after September 1st. My husband is going to Calgary in May, so I have a month to figure out how to convince him to pick up this beauty for me! This is the official logo of Canada 150. 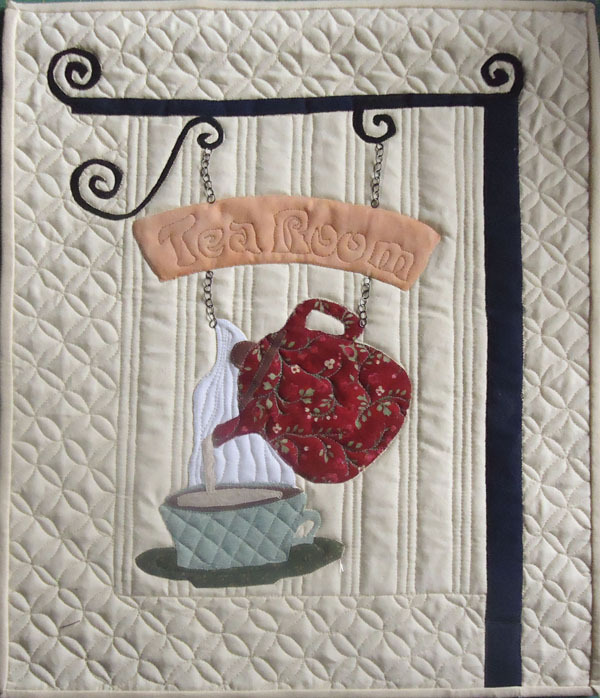 Here's a free paper pieced pattern from SeaSew by Dana Szucs Hayden. How can you resits? I'm not sure, since the other 2 critters are just as cute, and it's only March! You can purchase these kits individually or as a Block of the Month... one for each month of the year!!! 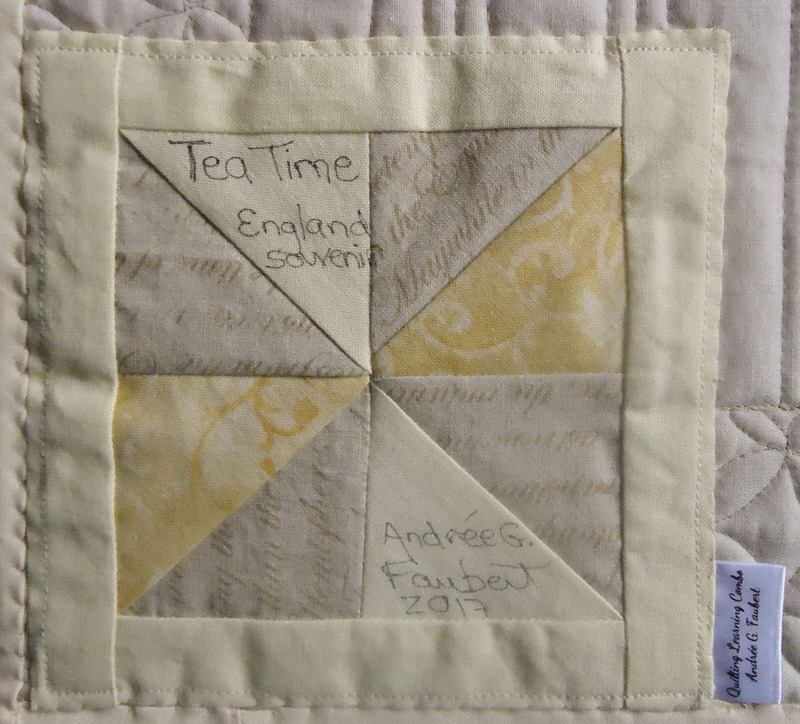 I don't think that I can stand any more amazing quilts and blocks right now, so here are some websites to find out what is happening around your area (or places you will visit) this year. The links are all below, in the Related Links section. I have to start with the Free Parks Canada Discovery Pass. This pass will get your group free admission this year to National Parks, National Marine Conservation Areas and National Historic Sites owned and operated by Parks Canada. It's a great opportunity to discover amazing places around the country. Check out the link below for details. You won't want to miss out. The Government of Canada has an internet site and an app to help you find events celebrating this special year. Spring brings with it the beginning of quilt shows around the country. I suspect that every show will have something to celebrate Canada's 150th. Check out what shows are coming in your area. Enjoy! Although I usually attend only one quilt show a year, I know that this year will be different. 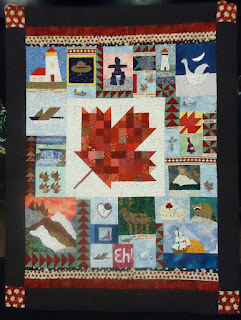 Although I can't travel across the country to give you accounts of all of these quilting events, I hope that you will link up if you have a post of any of these shows with their Canada 150 exhibits. 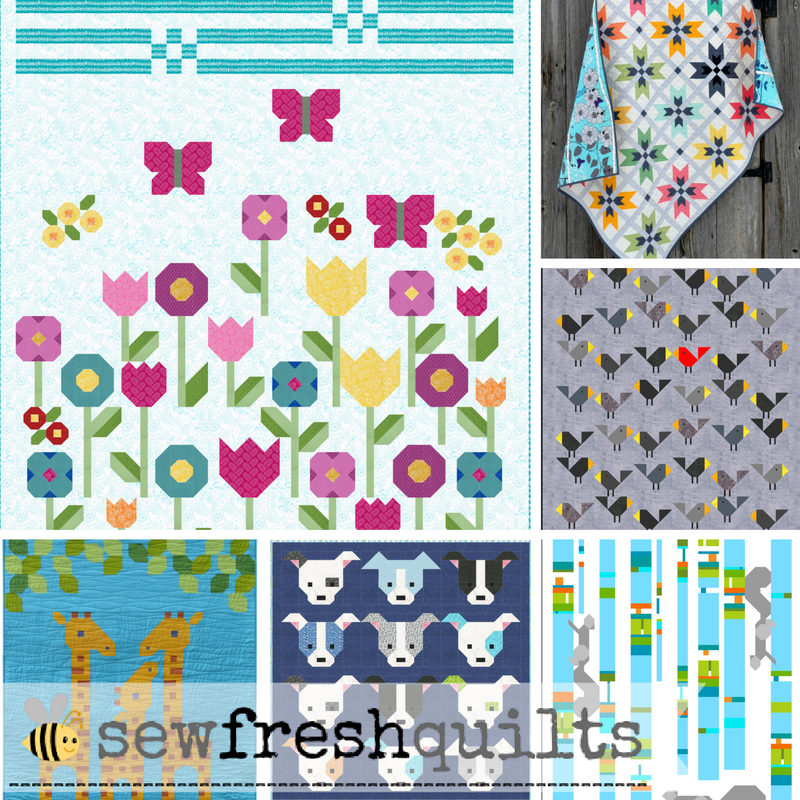 Aren't these quilt patterns wonderful? I'm not sure how I'm going to resist getting many more of these special designs. With everything that's going on, I posted my April objectives with my March Finishes. That's not how it works. So please bear with me as I repeat my April goals. Now it's your turn to show us what you are doing to Celebrate Canada's 150th.